According to ancient Shastras men or women are indebted to three forms of debts knowns as ‘Devaruna’, ‘Rishiruna’ and ‘Pitruruna’. Amongst these ‘runas’, clearing of ‘Pitruruna’ (ancestral debt) is important because we are indebted to parents or ancestors since we get this body only through them and we enjoy all material benefits through this body. ‘Pitruruna’ can be cleared by performing Varshika Shraddha or yearly death ceremony which falls on the date (Thithi) on which the parents or ancestors deceased. So on that particular lunar ‘Thithi’ this ceremony is carried out. 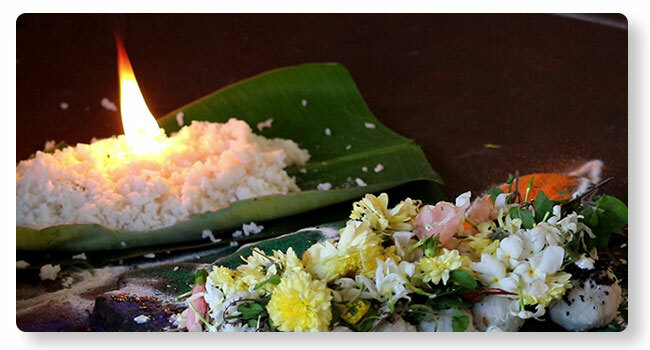 During this ritual, the Devatas (“VASU RUDRA AND ADITYA”) are invoked and through them ‘Tripindikarana’ Shraddha is performed where father or mother, grandfather or grandmother, great-grandfather or great grandmother is offered the ritual offerings. Pitruruna ceremony and rituals carried by surviving son or sons on the ‘Shraddha Thithi’ is known as Varshika Shraddha. Carrying out Varshika shraddha in ‘Teertha Kshetras’ (holy places) has been considered highly meritorious as mentioned in Puranas. We now offer an annual subscription service to have the Varshika Shraddha and Pitru Paksha performed every year in your parents or ancestors name in your absence at any of the holy ‘Kshetras’ across India. The ritual will be performed as per ‘Vedic’ practices by one of our qualified purohits along with an offering of food and ‘dakshina’ to eligible brahmins. Contact our customer support for enquiries on this service.